When I first picked this gun up at the local gun shop, I put it back in the case immediately, thinking it was far too light to be chambered for the .45 Long Colt. Then I went home and did some research on the internet. I was surprised to find that the vast majority of people who owned one were happy with it, and most reported that the recoil wasn’t all that bad. So I went back and bought it. I took the 450Ti out and shot it almost immediately. Recoil was remarkably tolerable for a big-bore gun. For the past year and a half I’ve been carrying a Smith & Wesson Model 60 in .357 magnum, so I’m quite used to a gun with a lot of recoil. The Taurus definitely has less recoil than my .357--I didn’t do any objective tests, so readers will have to be satisfied with my subjective impressions. It also seems to me to have less recoil than either of my two Charter Arms Bulldogs in .44 Special. One of my Charter Arms is Magna-Ported, which helps, but it’s still a hot little pistol to shoot and I rarely put more than five rounds at a time through it. But I put 25 rounds through the Taurus 450Ti and didn’t find myself flinching at all. 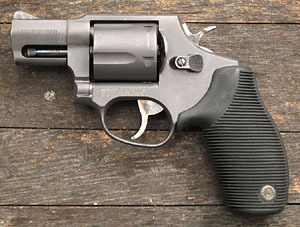 The Taurus is well compensated--it has six holes, three on either side of the front sight, that direct expanding gases from the ignited cartridge upward to help keep the muzzle down. It works very well. Of course, this means that the two-inch barrel is effectively only one-and-one-half inches. There’s got to be a lot of powder going to waste, but everything with a concealed carry pistol is a trade-off between effectiveness and concealability. I made all my shots at ten yards, and the gun held 3 to 4 inch groups with all five cartridges I tested. The two heaviest bullets (the 250 grain Winchester Cowboy Action and the 250 grain Speer Gold Dot) tended to shoot 3 or 4 inches high at ten yards, but I assume they would come in a little lower at a greater distance. The most accurate rounds seemed to be the Winchester Silvertip 225 grain (giving a 3 inch group--four rounds of which made a 2 inch group), followed by the Hornady Critical Defense 185 grain cartridges (with a 3.25 inch group). Kerby C. Smith, in his July 1999 Guns & Ammo article, chronographed 225 grain Winchester Silvertips at an average of 639 feet per second at the muzzle, for an average muzzle energy of 205 foot-pounds. I personally chronographed the same Winchester Silvertips at an average of 650 feet per second for an average muzzle energy of 212 foot-pounds. I also chronographed the 185 grain Hornady Critical Defense ammo at an average velocity of 839 feet per second, for an average muzzle energy of 290 foot-pounds. The Silvertip bullet is known for reliable expansion, and it is quite comfortable to shoot in the Taurus. Supposedly the Hornady Critical Defense ammo is optimized for short-barreled weapons with fast burning powder. I haven’t seen any test results for expansion, but I’ve heard very good things about the Hornady bullet design. It is a hot load and gives considerable recoil, but is by no means unmanageable. 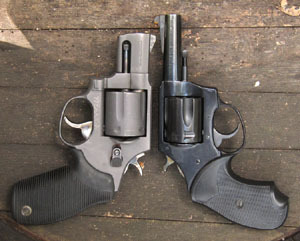 I ran ballistic comparisons between the .44 Special out of the Charter Bulldog and the .45 Colt out of the Taurus and found their performance nearly identical. The best rounds in either gun come in at approximately 80% the energy of 125 grain Remington half-jacket hollow points in .357 Magnum shot from my Smith & Wesson Model 60 with a 2.12 inch barrel, which have an average muzzle energy of 367 foot-pounds. The preliminary bottom line is that the Taurus 450Ti offers relatively low felt recoil and reasonable accuracy for a short barrel. The other good news is weight--the Taurus weighs exactly 23 ounces loaded with the 185 grain Hornady Critical Defense ammo. 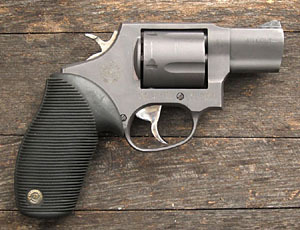 Compare this with my Smith & Wesson Model 60, which weighs 28.45 ounces loaded with Remington 125 grain half- jacket hollow points; or my custom Magna-Ported Charter Arms Bulldog, which weighs 24.9 ounces loaded with Winchester Silvertip 200 grain cartridges. And the Taurus has less felt recoil than either of these pistols. Carryability might be an issue for some people. I’ve gotten quite used to carrying my Smith in an IWB holster--it’s heavy but it’s slim. The Taurus is lighter but thicker. I made an IWB holster for the Taurus out of the thinnest horsehide I could find, and I find it comfortable for all day wear. I also made a shoulder holster, which I really like. This is a very easy gun to carry in a shoulder holster because it is so light. I bought a Galco holder for two speedloaders to go opposite the gun, but found it was like having a cancerous lump under my arm, so I gave it up--and the gun is light enough that it doesn’t require the counterbalance quite as much as heavier revolvers. I particularly like the shoulder holster when I’m in my car because I can still access the gun easily. The 450Ti is mostly made of titanium, which is why it is so light. The internal moving parts are hardened steel, as are the trigger, hammer, cylinder release, and ejector rod, and the barrel has a stainless steel liner; but the frame, cylinder, barrel envelope, and grip are all titanium. Titanium is as hard as some forms of steel but up to 45% lighter, and is extremely corrosion-resistant. It is very difficult to machine. I think this is why Taurus wanted to make guns out of Titanium--to say to the rest of the world that their technology was up to the task and that they are no longer a second-rate third-world gun maker (if indeed they ever were). So far as I have been able to tell, Taurus no longer makes guns from Titanium. One internet post indicates this is due to problems with the titanium guns, but another post indicates that production costs were too high to be competitive--I’m reserving judgment until I know more. If the latter is true, these guns will eventually become very collectible. If you look at the photograph above carefully, the Taurus’ frame is actually beefier than that of the Charter Arms Bulldog. The Taurus frame is slightly larger in every dimension, has a full ejector shroud, and its cylinder is slightly larger in diameter than the Bulldog. Yet the Taurus weighs less than the Bulldog. Those titanium cylinder walls are remarkably thin. The gun is not recommended for use with +P ammunition, but I have no desire to shoot +P in such a light gun anyway. 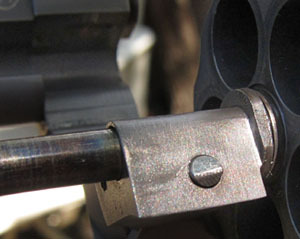 The top of the cylinder crane has a spring-loaded plunger that fits into a recess in the top of the frame just beneath the rear of the barrel. This serves as a crane latch and holds the cylinder firmly in position. Even when you press the cylinder release catch, the cylinder is held in place and must be pushed out from the right with the fingers. Obviously, this assures good line-up of the cylinder with the barrel. According to Kerby C. Smith, it also allows the ejector rod to be longer, for more positive ejection. An area where my knowledge is incomplete is lubricants for titanium. Normal hydrocarbon-based lubricants are not very effective for titanium. A post on a biking forum indicates that copper paste grease is preferred for titanium-to-titanium and titanium-to-other-metal interfaces, and that appears to be what the previous owner of my gun used. If any reader can direct me to a source for further information, I would be most grateful. The trigger on the 450Ti is probably its worst feature. It is a heavy trigger pull and not nearly as smooth as I would prefer--the pre-production gun that Kerby C. Smith tested in 1999 had a 15 pound trigger pull, and Wolff Springs states on their website that the standard hammer spring on the Taurus is 14 pounds. Wolff makes a spring set with 10, 11, and 12 pound hammer springs, and also a reduced power trigger return spring. I tried the 10 pound hammer spring, but it would not reliably ignite primers, so I installed the 12 pound spring, which works fine. I stoned the surfaces of the trigger, hammer, and cylinder lock as best I could, but the Taurus parts are not as finely finished as Smith & Wesson’s, and I wasn’t always able to get the surface finish as smooth as I desired. I removed the trigger return spring, ground it down slightly, and polished it. My trigger pull measures just over 12 pounds now. The surface of the trigger where the finger goes is polished smooth from the factory, just the way I like it, and there are no sharp edges. The grip was specially designed for the gun, with soft rubber ridges that run all the way around the front and sides, but are thickest at the front, over a polymer core. It is tall enough to allow all my fingers to fit on it, and is definitely optimized to absorb recoil. I looked around for third-party grips, just to see what was available, but most seem to have finger grooves, which I disapprove of. 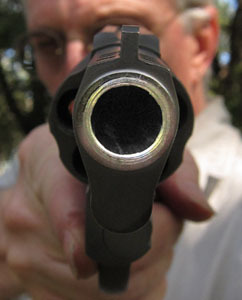 Finger grooves make it more difficult to grasp the gun quickly in a fast-draw situation. I think this Taurus grip design is one of the best in the business--instead of your fingers having to conform themselves to the shape of the grip, the front of the grip automatically conforms itself to the position and shape of your fingers as you grasp the gun. The sights are fixed and are designed not to snag on things. 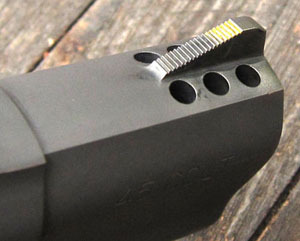 The compensator holes tend to blast the front sight with propellant residue, but it doesn’t hurt anything and can be scrubbed off when the gun is cleaned. Since the barrel has a stainless steel liner, it can be cleaned with whatever you normally use. For the cylinders I use Blue Wonder Gun Cleaner, and it does a good job.